LaRue County is a county in Kentucky. As of the 2010 census, the population was 14,193. 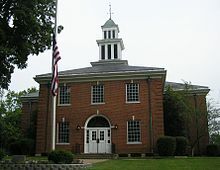 Its county seat is Hodgenville, a city best known as the birthplace of United States President Abraham Lincoln. ↑ "State & County QuickFacts". United States Census Bureau. Retrieved March 6, 2014. This page was last changed on 26 August 2017, at 00:56.